Many cyclists, especially those who are inexperienced or unskilled, are nervous about using roundabouts. Indeed accident statistics indicate a higher accident rate for cyclists at roundabouts, compared with other intersection types. Unskilled cyclists often negotiate roundabouts in an unsafe manner contributing to the high accident rate. 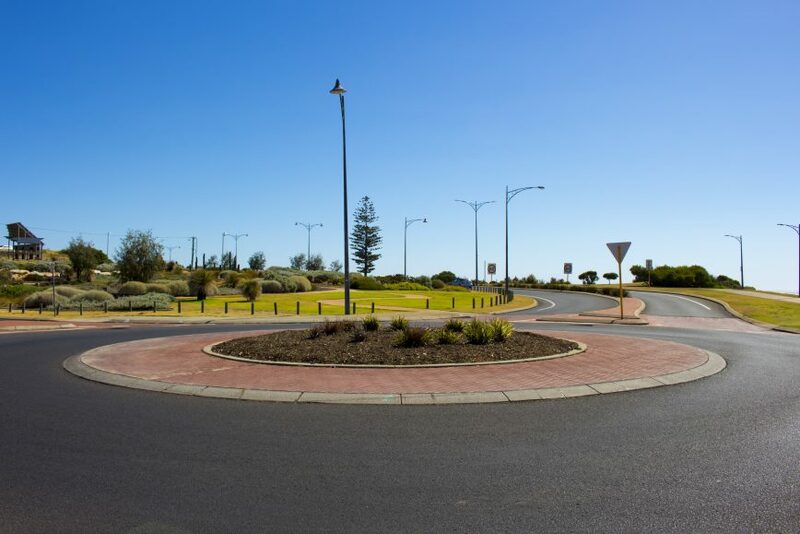 The following article describes recommended techniques for safely negotiating single-lane roundabouts. Using these techniques, which are easy to master, you will find roundabouts simple to negotiate. In fact roundabouts offer cyclists the same advantage they do motorists in that they make it easier for cyclists to turn right and give traffic on each entering street an equal go. Before we consider how to best ride roundabouts it is useful to understand why cyclists have a high accident rate at roundabouts. Most accidents (70%) involving cyclists on roundabouts occur when a cyclist (on the roundabout) is crossing an entry onto the roundabout. The cyclist is hit by a vehicle entering the roundabout. This is because motorists often enter the roundabout at reasonably high speed with only a quick glance to their right to look for traffic on the roundabout. A cyclist who may be riding at the left hand side (outer edge) of the circulating carriageway of the roundabout is not noticed. Another common type of accident for cyclists using roundabouts is when a cyclist, crossing one of the exits from the roundabout, is hit by a motor vehicle exiting the roundabout. Again this occurs because the cyclist is riding on the outer edge of the roundabout, outside the zone of maximum concentration of the exiting motorist. Often the motorist assumes that the cyclist is taking the next exit on the roundabout. In fact the cyclist swings right to continue around the roundabout, into the path of the exiting motorist. These two preceding paragraphs indicate the dangers of marking bikelanes through the roundabout. Where these lanes are marked you should not use them as they are unsafe and do not indicate the correct position to ride on the roundabout. Write to the local council or RMS and ask for these unsafe markings to be removed from the roundabout. It is best to move out into the middle of the lane (usually about 30 metres) before the roundabout. You should do this whether you are going straight, turning left or turning right. Sometimes to inform drivers of your intention to move to a position in the middle of the lane a short right turn hand signal is of assistance, this lets them know you are intending to move across and usually they will leave a gap for you once they are aware of this. Taking up this central lane position prevents any cars from overtaking you before or through the roundabout. On occasions when you may encounter a driver who insists on overtaking you simply let him/her through and then move out behind. Occasionally a motorist will wrongly assume s/he can overtake you before the roundabout. Normally the motorist will slow, once s/he realises there is insufficient room, and pull in behind you. If it looks like the motorist will cut across the front of you on the entrance to the roundabout then slow slightly and allow him/her to move in front. The benefit of taking a central lane position is that you are now riding in the area where motorists entering the roundabout look for other traffic. If there is a motorist behind you then s/he has already seen you. The presence of the motor vehicle makes it even less likely that an entering vehicle will pull onto the roundabout in front of you. By not allowing following motorists to overtake on the roundabout you have eliminated the second major cause of car/bike accidents on roundabouts (the exiting car hitting a cyclist continuing around the roundabout). Through the roundabout you should continue to position yourself so that following vehicles cannot overtake and you are well away from the outside edge of the roundabout. Somewhere slightly towards the right side of the circulating carriageway of the roundabout is best. If you are going straight ahead or right at the roundabout you should observe traffic approaching the roundabout on your left to check that you have been seen. Because of your positioning you will be seen. If you are going left you should still position yourself at the roundabout entrance so that following vehicles cannot overtake. Overtaking vehicles block your vision of traffic on your right and distract you from what you should be doing, safely entering the roundabout. Immediately prior to entering the roundabout you should signal your intended direction of exiting the roundabout (left or right), give no signal if you are intending to go straight ahead. This will inform following drivers of what you are doing. If you are approaching the roundabout downhill it can be difficult to signal if you are using your brakes, it is best to give a short signal some way before the roundabout and at the roundabout entrance concentrate on controlling your bike with both hands. Do not signal and brake at the same time. If you are turning right on the roundabout it can be difficult to signal as you go through the roundabout. Normally if you signal at the approach this is sufficient information for following motorists to understand your intentions. The difficulty is with motorists approaching the roundabout from the opposite direction who need to know that you will be turning across the front of them. If you cannot signal continuously then give a signal prior to crossing the entrance of the opposing traffic onto the roundabout. In this way they will know that you are intending to turn across the front of them. Under our traffic rules vehicles can signal left prior to exiting the roundabout. This will not contribute to your safety in using the roundabout but if you are able to do it without difficulty then you should. If looks professional and is a courtesy to other road users. On a small roundabout there may not be sufficient time to do this. Upon exiting the roundabout you should maintain the central lane position until there is sufficient room to move left and have following motor vehicles overtake safely. Normally once you are clear of the splitter island at the exit you will be able to do this. If you need to turn right shortly after the roundabout then maintain your lane position and signal your intended turn.